Reasons for cracked heels are lack of moisture, improper foot care, an unhealthy diet, aging, prolonged standing on hard floors and wearing the wrong types of shoes. Conditions like eczema, psoriasis, corns and calluses, diabetes and thyroid disease may also contribute to the problem. In addition, to dry, thickened skin, the problem may be accompanied by symptoms like redness, itching, inflammation and peeling skin. Taking proper precautions right away can prevent cracks from getting deeper and causing bleeding and pain. Scrubbing is very important for your foot. Simply mix the granulated sugar in coconut oil & few drops of lemon. Massage your feet with this mixture. It will remove all dead skin from your feet, leaving it neat & soft. 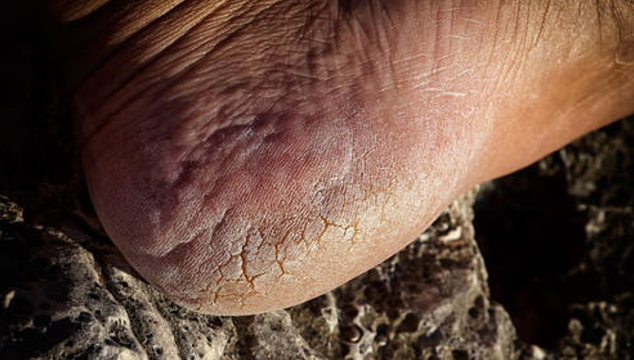 Your feet carry the long list of pressure points. A regular foot massage is very relaxing & soothing. Soak your feet for some time in hot water before taking shower. Hydrate your feet with good quality moisture after a shower. Use Soaps which are rich in moisture rather than using oil control soaps. Apply Petroleum jelly or Glycerin on your foot. Absorb that in your skin. Now apply another coat of it & wear a thick pair of socks. Leave it overnight & get amazed by its result. Create a moisturizing cracked-heel cream at home. Simply mix olive oil & Lavender oil in a bottle. Add few drops of Lemon juice & mix it well. Use it on the affected area. Paraffin Wax is a natural emollient that soothes your skin. It retains the natural oils in your skin. Place some Paraffin wax in microwave or in a double boiler. Add mustard oil in your wax at an equal amount. Apply this thick paste on the cracks & put on wool socks. Leave it overnight to get better results. Epsom salt is also very useful to cure foot problems as it draws out toxins & magnesium in this salt promotes foot skin health. Add a half cup of Epsom salt in a tub of warm water. Soak your feet in it for 10 minutes. Gently rub your feet in it for 10 minutes with the pumice stone. Now apply a mixture of glycerin & lemon juice. Repeat this on regular basis for better results. Mentholated Rub Is a mixture of Natural Oils. You just have to apply it simply on your feet overnight. Source: Mrs. Rekha Champaneria: Dietician & Diabetic Educator.